1. Make healthy popsicles. Yes! I managed to do this a little; but I'd like to make some more before summer is officially over. Here's my combination of peach yogurt strawberry popsicles. 3. Wear nail decals. Finished this one just in the nick of time! We're celebrating a special birthday for my Mom this Saturday, so I wanted to have nails pretty for that. 4. Do something nice for the people who helped us during our house crisis. I started this but didn't get it finished. Guess I can't really count what I didn't complete...but maybe a half point? 5. Chalk art. Yes! I'll be showing my chalk-art porch project next week; it was SO fun to do. I'm thinking of "chalking" a rug on the back patio to see if I like it enough to paint one. 1. Read Show Your Work and get super inspired! Austin Kleon's last book Steal Like an Artist, stole my heart. It was just what I needed to propel my art projects forward; so I'm beyond excited about his next book. It's exactly what I'm needing at this point in my journey! 3. Add one new movement to my day. Since I'm trying to move more; I want to add another active movement to my day. Maybe yoga...maybe more consistent walking of my dog. I'm not sure yet, but I'm on a good path with this and want to continue it! 4. Go on an adventure to see the blue whale. My youngest daughter has been dying to see this quirky statue of a blue whale. We want to take her before school starts and things get crazy. 5. Open a business bank account. This sounds overly simple but I've been ridiculously procrastinating it and it's super important. It's holding me up because I want all my business pieces into place before I open my shop. This probably should've been done long ago, but...baby steps. What are your thoughts for August? 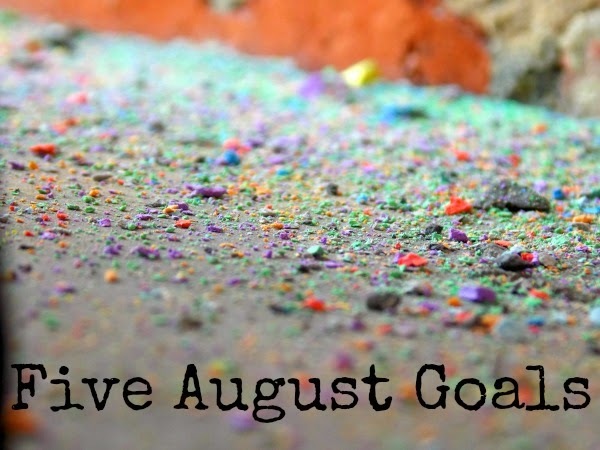 I just love this idea of publicly stating your personal goals for the month and recapping your progress. We all need a little help to keep us accountable, and this is just a great way to do it. (I also love that you don't berate yourself for missing any marks.) Good luck in August! Thank you, Kimberly! I've really enjoyed it; it's helped me engage life this year. As for not berating myself, that's growth for me. :) Thanks for the good wishes!